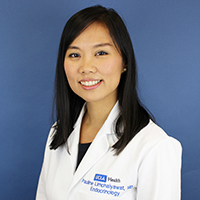 Dr. Pauline Limchaiyawat is an endocrinologist who practices in Beverly Hills. She is board certified in internal medicine and endocrinology, diabetes and metabolism. Her clinical interests include diabetes and parathyroid, as well as adrenal, pituitary and thyroid disorders. Dr. Limchaiyawat received her medical degree from the University of California, San Diego School of Medicine. She then completed her internal medicine residency at Harbor-UCLA Medical Center, and a fellowship in endocrinology, diabetes and metabolism at the New York University School of Medicine. She earned her bachelor's degree in biochemistry and cell biology and her master's degree in biology from UC San Diego.